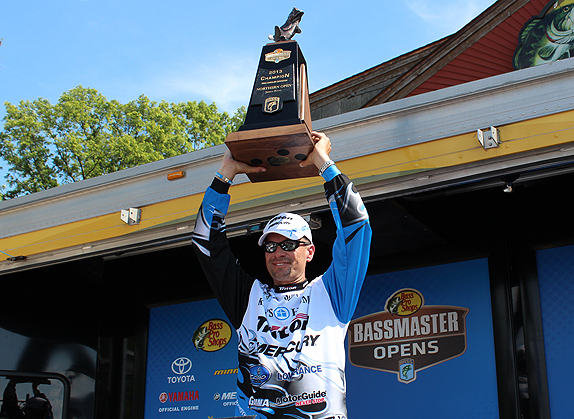 Randy Howell dodged a 2-pound penalty on day 1 to win by more than 6 pounds at the James River. Incurring a 2-pound penalty in a high stakes bass tournament is like being whistled for a 5-minute major in overtime of a Stanley Cup playoff game. It can be a death knell to any hopes of winning. 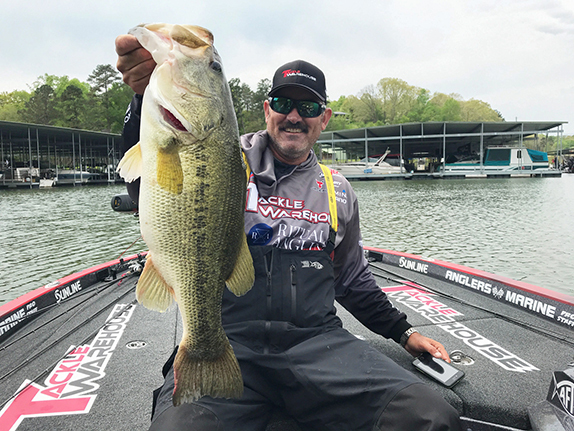 Despite being hit with such a penalty on the first day of competition at the James River Northern Open, Randy Howell skirted the potential disastrous outcome as he erased a small day-1 deficit, took the lead on day 2 and pulled away to win by more than 6 pounds. Howell, who grew up along the Virginia-North Carolina border not far from the James, hadn't won a tournament since April 2004 when he claimed an Elite 50 event at Lake Dardanelle. He said it was a thrill to hoist a trophy in front of so many friends and family back where his fishing roots began. "It's still just unreal. I woke up (Monday) and was like, 'I hope I'm not dreaming,'" he said. "I guarantee you I appreciate it a lot more than most anybody who's won a tournament. First, to break my winless streak of 9 years, it's big for my confidence and to get into the Classic on top of it, it's amazing." He's also hoping the win helps him turn things around in Elite Series competition. He's presently in 60th place in the Toyota Tundra B.A.S.S. Angler of the Year (AOY) standings and would've needed three straight Top-30 finishes, at least, to close the season to have any hope of qualifying for next year's Bassmaster Classic at Lake Guntersville. Now, all he needs to do is show up to the final two Northern Opens (Oneida Lake and Lake Erie) and he'll lock up a spot in his 12th career Classic. "Now, my goal is to double qualify," he said. "I'm facing having to get three Top-30s in a row, which is doable, but it's no guarantee. Now, I don't have to worry about it. I can fish a little more free in the last three and maybe even try to win one. The first thing (Brent) Chapman told me Sunday night was, 'You're not going to believe how good you feel and relaxed you are,' because he went through the same thing last year." The final day saw many of the 12 finalists struggle under post-front bluebird skies. Not Howell, who was the only angler to weigh more than 12-09. His 15-04 stringer was more than enough to help him beat Virginian Mike Hicks by 6-01. 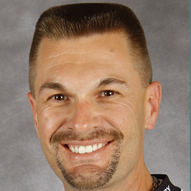 When Howell got involved in tournament fishing when he was 16, he fished the Piedmont Division in the Redman Series and the James River and Chickahominy River were on the schedule twice a year. He also fished a pro-am team trail that included both venues, so he fished the tidal rivers multiple times a year for several years in his late teens. "It's funny how long ago that was," he said. "It's more than 20 years now and none of it looked the same. I normally remember everything about lakes and rivers when I go back to them, but this place looked totally different and that was probably a good thing since I didn't get caught up in any bad habits or preconceived notions." In chatting with Virginia pros David Dudley and Jacob Powroznik, it became apparent to Howell that focusing on the Chickahominy gave him the best chance to possibly challenge for the win. He enlisted the help of friend Eddie Griggs, who guides at Lake Gaston, Buggs Island Reservoir and the James, to help him with navigational strategies prior to the official practice period. "We ran the river on Saturday and he taught me a lot of about the shortcuts," he said. "He showed me how to run to the Chick without wasting time. He also showed me some fishing areas, but by the first day of practice, I'd already committed to the Chick." For practice, he put in near the Walker Dam, which separates the Chickahominy River from Chickahominy Lake. It didn't take him long to pinpoint the general area he eventually targeted during the tournament. "I saw all the water rushing over the dam after the rains from that hurricane," he said. "I just had a gut feeling there were a lot of fish there. Moving water always attracts fish, especially when it's warm." He caught a couple decent fish, but on the last day of official practice, he went there first thing in the morning. "I wanted to know if I could start there and catch a couple, then go hit some pads because I'd had some success throwing a frog in some pads later on," he said. The key to the whole event for Howell was drawing a low enough boat number so he could utilize the shortcuts Griggs suggested to get to the Walker Dam spot before anyone else. He wound up with boat 23 and managed to win the race to his prime area. "I knew I could pass just about everybody just by cutting off those corners," he said. "The last boat I passed was at the mouth of the Chick and that was Stephen (Bub) Tosh, who also has a Triton. It took me about 47 minutes to get there." Tosh pulled into the spot by the dam about 30 seconds after Howell got there. "Once he saw where I was going to be, he just smiled and went to the other end of the dam," Howell said. "At the weigh-in later he said he thought he might be able to win the tournament there. After he saw me there, he said he thought I was going to win it there." He started throwing a crankbait and also tied on a Senko rigged on a dropshot, but didn't get bit. His co-angler was throwing a wacky-rigged Senko and quickly caught a 3 1/2-pounder. "I thought there could be something to it because I hadn't really figured out the fish there much as far as what they wanted," he said. "I put the purple emerald flake Senko on and went to a 1/8-ounce weight and when the tide came down the bite got going." During the flurry, he caught two 5-pounders within 10 minutes � he'd never caught two 5s out of the Chick on the same day � and in the wake of the excitement he neglected to cull his smallest fish when he put the second kicker in his livewell. Once he realized his error, he phoned tournament director Chris Bowes and was assessed a 2-pound penalty. "I was sick the rest of the day," he said. "I was just hoping I didn't blow it. I hooked another big one later, but it broke me off. It just gave me the confidence to know that this was a spot I could possibly win on. I didn't know that when I started there." His raw weight was 17-11, which would've put him in the lead, but the penalty knocked him back to 15-11 and that had him in second, 6 ounces behind Wayne Vaughan. After a blustery thunderstorm passed through Thursday afternoon and evening, it put a lot more stain and flow into the Chick and it didn't take long for him to realize his prime spot had changed. "I didn't catch a fish until almost 9:40 the second morning," he said. "I almost left it. I think the reason they weren't biting was we had that big storm Thursday afternoon and it messed up how they fed." 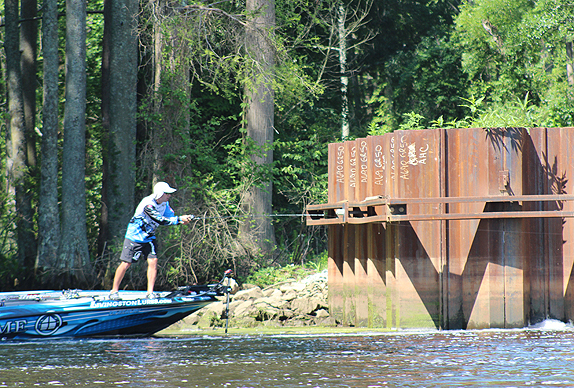 Figuring out the right cast was vital to Howell's victory near his old stomping grounds. He threw a variety of baits at them Friday � crankbaits, spinnerbaits, Senkos � and had a flurry between 10:30 and 11:45 when the tide started to pull out. "I caught about eight keepers during that stretch and four or five were on the Senko," he said. "One was a 4-pounder and I had another close to 4 on a crankbait." 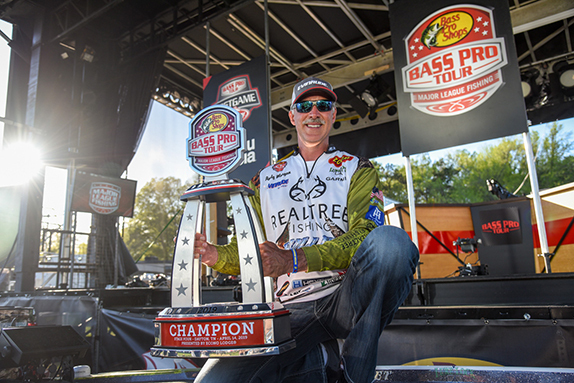 He finished with 16-12 and that gave him more than a 1-pound lead over Mike Hicks entering the final day. Bluebird skies greeted the finalists last Saturday and the fishing got tougher, except for Howell. "We had clouds and good biting weather on days 1 and 2," he said. "I figured it would get tougher on everybody else. At the same time, I didn't want to be sweating it because of that penalty. I wanted to catch five right away." Because of the earlier blast-off time on the final day, he arrived at his spot at 6:15 and immediately caught two 4-pounders on a topwater bait to take the edge off. "I knew I had my two kickers then," he said. "I knew I'd still be able to catch a limit because I had places I hadn't even fished yet, but I had no other place where I could catch a 4- or 5-pounder." The bite cooled off near his prime spot and he migrated to the other end of the dam and caught another one on a Senko before moving to a point where he Carolina-rigged another keeper. He went back to his best spot and completed his limit with a 2 1/2-pounder. 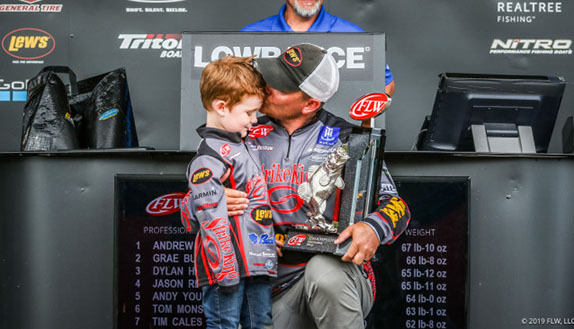 Another 30 minutes passed with no bites and he started thinking about his thought process at last year's Oneida Lake Elite Series, where he was the day-3 leader but made a key move too late on the final day and wound up with just four fish, ceding the win to Boyd Duckett. "It was around noon and I knew I didn't follow my gut early enough at Oneida so I told my co-angler we were going to another spot and between 12:50 and 1:50, I caught a 2-pounder and another 4 and closed it out that way," he said. "In my mind, I needed to do it that way." Above all else, figuring out how to deliver the bait so it would reach the fish was the most important aspect of Howell's strategy. "The hard part was getting the cast just right," he said. "It's probably why so many people have fished there and haven't caught them. You had to throw it up against the wall under a steel beam and let the current pull it down into the hole right there. Figuring that out was the biggest part. "They wouldn't bite anything consistently but the Senko and once the tide got right, the cast had to be perfect. I could still skip the Senko under the wall and the water would push it down into the deep hole. It would happen so fast. By the time it got there, I had to reel up slack real quick and usually they'd have it by then." > Wacky-rig gear: 7' medium-heavy Daiwa Steez SVF-XBD spinning rod, Daiwa Certate 2500 spinning reel (6.0:1 ratio), 20-pound Daiwa Samurai braided line, 12-pound Gamma Edge fluorocarbon line (leader), 2/0 round bend Easy 2 Hook hook, 5" Gary Yamamoto Custom Baits Senko (purple emerald flake), 3/8-oz. homemade dropshot weight. > Depending on the strength of the current, he'd lop off part of the weight to achieve the right fall rate so the current would carry the bait down into the key depth zone. "I usually had it heavier in the morning when the current was stronger. There was a lot of junk down there. I lost a ton of weights." > He ran out of Senkos on day 1 and spent part of the evening trying to find a tackle store that carried his go-to color. "That night it stormed pretty bad and it was a 30-minute ride to Bass Pro Shops, but they were closing early because they didn't have power," he said. "I found another place and spent $100 on Senkos. I didn't have my camper with me and all I had were clear-water colors like green-pumpkins. I only had one bag of the purple emerald flake. They really liked that color, especially in the tanic, copper-tinted water." > Crankbait gear: 7' medium-light Daiwa Tatula casting rod, Daiwa Tatula casting reel (6.3:1 ratio), 12-pound Gamma Edge fluorocarbon line, Livingston Lures prototype circuitboard-lip crankbait (Tennessee shad). > The crankbait can dive to 7 feet on a long cast with 12-pound line, but Howell said he was making quick, short casts to comb the upper portion of the water column. The plug, which is yet to be named, will be among eight new baits Jerry Rago has designed for Livingston that will be unveiled at ICAST next month. > He also threw a 1-oz. Hawg Caller spinnerbait (chartreuse white) with a No. 5 willow-leaf blade. > Main factor in his success � "Being able to figure out the right cast so the bait would get down to the fish. It was intense the whole time. It was a lot of hours trying to figure the right cast and how the fish were set up there. That was the cool thing about it. I like situations like that where you're constantly having to think your way through it. It keeps you on top of your game all day." > Performance edge � "My Triton/Mercury rig with HullSpeed paint coating that I've had on since the Classic. That's definitely helped me pick up a couple more MPH on the water. On that long run, it was all about getting to the spot first. If I hadn't have gotten there first on day 1, none of this would've happened." > There has been some chatter about pictures of Howell posted in a day-3 photo gallery published on Bassmaster.com. In some of the photos, Howell can be seen fishing in the vicinity of a sign that said, "DANGER. For your safety access to dam prohibited. Stay back 100 ft."
Because of the angle from which the photo was taken, it's difficult to discern the sign's location in relation to where Howell's boat is. When asked about the issue, Howell said he spoke with B.A.S.S. tournament director Chris Bowes at the registration meeting prior to the event about the exact sign in the photos. "We were told we could fish anywhere along the dam and the Game and Fish people said we could even tie up to the dam if we wanted," Howell said. "I confirmed it with Chris because I knew that's the spot I wanted to fish. The sign was for the lock gate, but it had a barricade around it because they were doing some work on it and you couldn't even get to it." "Rick Clunn, Larry Nixon and Guido Hibdon have helped me, been nice to me and treated me with respect even when I was just starting out." St. Clair - "It's probably one of the best lakes in the country, but it's my least favorite. I can catch fish there, but I never finish well." Bill Morgan - "He's the man who started Hawg Caller spinnerbaits, he started the whole crankbait craze in North Carolina, and he mentored David Fritts and Hank Parker and lot of other guys, and did the same for me." "I like to spend time with family, go to chruch and just take it easy." "I just love it. I've always done it ever since I was old enough to walk. I still get so excited every time a catch a fish. My hands still shake."